Because I have reviewed several iPad keyboards on this blog, I was recently contacted by Brydge (brydgekeyboards.com) and asked if I would review their new “Brydge+ With Speakers” keyboard. Sure. Glad to. Yes, Brydge sent me this keyboard and I didn’t pay for it. While there is always the glee of getting a new gadget in the mail — I took care in this review to use my usual hyper-critical eye and give a fair review. I’m going to approach this as a straight review, although sometimes I will compare it to my ZAGG keyboard, which is reviewed (compared with a Logitech keyboard) here. There are four overall things to review: The keyboard functionality, its attachment to the iPad, the weight, and the extras. There are some basic requirements of keyboards that don’t change, whether you’re talking about a portable keyboard for a tablet or a “real” keyboard for your desktop system. Pretty much any iPad keyboard is going to have a tray of keys that is going to be the width of the iPad. If you’re new to mobile computing and are accustomed to full-size keyboards, this will be a big adjustment. But if you’re used to the mobile keyboards out there, then this is pretty much the same size. There is nothing flimsy about the keys on this keyboard, and there is no “play” in them: they are firmly attached with no rocking. They feel very solid and do not at all seem fragile. The travel of the keys is very nice, and the springy retort offers nice tactile feedback. The F and J keys have a slight ridge near the front for the benefit of the touch typists out there, but I think that’s pretty standard across mobile keyboards. Just like other keyboards out there, you’ll find Shift, Control, Alt, Option, Command, and the funky Celtic-knot symbol key characteristic of Apple keyboards. This allows for the use of those keyboard shortcuts that we’re all so dependent on with our laptops. However, while a Windows-based system will have you use the Control key for copying, pasting, and other functions, every iPad keyboard I’ve ever used, including this one, mimics the Mac, using the Command key instead. What the Brydge+ keyboard has that I don’t always see in other mobile keyboards (including the ZAGG) is a Function (Fn) key. While I’m glad to see it and it seems to work just fine, it appears that the only additional functionality is to let the arrow keys double as Home, End, Page-up, and Page-down keys. That’s nice, but it seems to me they could have done more. So as odd as it is to say this about such a simple thing, I really appreciate it that the Brydge+ keyboard completely erases all the confusion by putting a Backspace key here, omitting the delete key. It does the exact same thing, but now the labeling on the key won’t confuse all of us Windows users. Want to delete something? Highlight the text or move the cursor to to the end of it, and tap the Backspace key. Just like it’s supposed to work. No more confusion. If you’re a Windows user, this one feature alone might be the reason you will prefer the Brydge+ keyboard over the others out there. Search. This first brings you to the Home screen and then opens the Search field. Playback. A set of three keys to rewind, play/pause, or fast-forward. This works in iPad-native music and video players and controls your slideshows in the iPad-native photo app. It did not work in any of the third-party video apps I tested it in. Volume. A set of three keys to mute, decrease, or increase volume. This worked in every app that I tested it in. Off. A key to turn the iPad off. Even though the icon on this key is a padlock, it will only lock the iPad if that’s how you have things set up in your Settings>Passcode>Require Passcode settings. Where my ZAGG keyboard has special function keys for copy, cut, and paste, the Brydge+ keyboard has the two brightness keys and the language key. Personally, I think having a key to switch the language for the keyboard layout is a waste of limited keyboard real estate. Why? Because I expect only very few users have to switch back and forth so very often. But I find the brightness keys extremely useful. One of the video apps I use annoyingly pauses the video when I adjust brightness using the on-screen control (swiping up from the bottom to get to the brightness slider). With the Brydge+ keyboard, it was wonderful to watch a video and be able to adjust the brightness without interrupting the show. 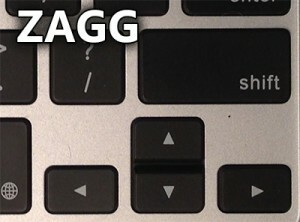 One problem I had with the ZAGG keyboard was a not-infrequent intermittent doubling of letters. I hit the T key once, and there are two Ts on the screen. ZAGG had a workaround for it that involved a hard-reset, but the problem kept coming back. 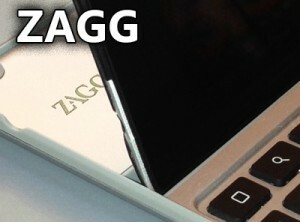 I like the ZAGG keyboard quite a lot, but this double-letter thing was frustrating at times. I mention this here because I have noticed this issue with this keyboard, too. However the issue appears to be so very infrequent with this keyboard that I’m not really concerned about it. This is very difficult to quantify because it is so intermittent. For the sake of comparison: with my ZAGG keyboard I could type a few paragraphs of text and there would be maybe 10 words with doubled letters, but with the Brydge+ there might be none, or just 1 or 2. So the problem exists. But I don’t think I care much. Maybe if I was such a perfect typist that I never experienced typos then I would be annoyed. But I’m not that kind of typist. So I’m not annoyed. So the actual keyboard functionality of this product? I like it very much. It’s sturdy, I like the special function keys, I love the Backspace key, and it generally works well. I’m not wild about the placement of the shift key on the “wrong” side of the arrow keys, but I’m thinking this is just an issue for us sight-typists and I’ll get used to it. You attach your iPad to the Brydge+ keyboard by slipping it into two well-padded grippers that are attached to very sturdy hinges. Earlier versions of the iPad are not quite as thin as the newer versions. The keyboard comes with special hinge-inserts that owners of early-generation iPads can use instead of the ones that are built into the hinges, and instructions are included that tell you how to take care of that. I have a 3rd generation iPad, so this review doesn’t go into that. These grippers with the default pads hold onto the iPad very snugly. The fit is so firm that, even though the documentation that comes with the keyboard tells me not to, I can pick this up by the iPad and the keyboard stays firmly attached. I can pull the iPad off very easily, but it’s not effortless: your iPad will never accidentally fall out of the hinge unless something destructive has happened to the padding in the gripper-thingy (technical term). This attachment method has several advantages over other iPad keyboards that I have used. First, the hinges provide a continuous range of motion. Without getting my old plastic protractor out of my office-supply drawer, I’d guess the range is about 165 degrees. I can fold the whole thing shut like a mini-laptop, or open it all the way and lay it nearly flat. This is especially nice as you can make small adjustments to reduce glare. With the ZAGG, the iPad sits in a nice, angled ledge. You set it in the ledge, and it stays put. It’s nice, but there is exactly one angle. 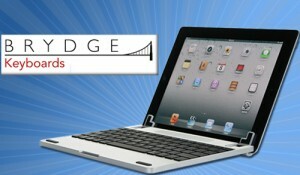 The one advantage of ZAGG’s ledge-style way of attaching the iPad over the Brydge+ hinges is that you can position your iPad vertically or horizontally. It’s nice to have something that will let me set my iPad up vertically so I can read while eating a messy burger with both hands. The gripper-hinges on the Brydge+ keyboard are spaced far enough apart so that they can get a firm grip on your iPad without obscuring any of the display. As such, they are too far apart to hold the iPad in the vertical position, and you need need both the grippers for it to be able to really hold the iPad. So I’m fine with keeping the iPad in a horizontal position. The Brydge will do this just fine, as long as you don’t mind reading with your iPad positioned horizontally. The first thing I noticed when I got this keyboard is that it is not a featherweight. In a landscape in which tablet manufacturers compete in fractions of ounces for who can be the lightest, this keyboard will tip the scales. According to my handy digital postal scale, the Brydge+ keyboard weighs 18.8 ounces, while my ZAGG keyboard weighs 14.6 ounces. Only a 4.2-ounce difference, but that’s about 29%. Add to that the weight of the actual iPad (my iPad3 weighs 24.2 ounces) — and the total weight comes to 43 ounces — or 2.7 pounds. But there are two reasons why I don’t care about the weight. First, when I step out the door with my keyboard, it’s because I know I’ll need to do some serious typing, but I don’t want to lug my heavy laptop along. Compared to my laptop (or almost any laptop, really), my iPad with this keyboard is absurdly light. I mean, it’s still just 2.7 pounds! The second reason is that I want my keyboard to have some substance to it, and substance requires a bit of weight. Back when I reviewed a Logitech keyboard (I’m a big fan of the Logitech brand), my main gripe with it was that it was so slight that it seemed almost fragile. Give me substance in my peripherals — I use these things heavily, so they need it! With the Brydge+ keyboard, I don’t feel like I’ll have to worry about this thing getting finicky after being crammed in the overhead bin on the plane. The “extra” that I got from my ZAGG keyboard was backlit keys. When I bought the keyboard, I envisioned how nice this feature would be for typing in a dark room. After all, the beloved Lenovo ThinkPad I had 10 years ago had a little light above the display that shined onto the keys, and I found that very useful. So surely backlit keys will be awesome! Well, I’ve never once used the feature. Maybe it’s great — I don’t know. It just hasn’t come up. 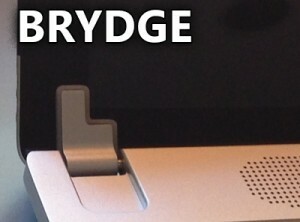 The “extra” that the Brydge+ brings to the table is a built-in speaker. What this speaker brings you is a little more volume — but it doesn’t get all that much louder than the speakers built into the iPad. Make no mistake: This is not a fine audio product: If I want great sound (like for putting on Philip Glass’ Koyanaasqatsi and cranking it up loud), I’ll either use my good earbuds or I’ll plug in my high-end Logitech sound system complete with sub-woofer. The sound from the Brydge+ built-in speaker sounds a bit “tinny” compared to that of the built-in iPad speaker, so for warmth, bass, and good tone, you’re better off with the iPad. But if what you’re after is a little more volume, then you’ll like this solution. Another possible advantage of using the speaker built in to the Brydge+ keyboard is that it would presumably save some of your iPad’s battery life. I don’t know if the battery-cost of Bluetooth outweighs the battery-cost of driving the speakers, but I would assume it would be a savings. But this is for a reviewer with a bit more technical savvy and patience than I to say. I’ve really enjoyed my ZAGG keyboard, but I think I prefer this new keyboard from Brydge. Yes, there were a few of the special function keys that didn’t work as expected, but frankly I’m not a big user of those keys anyway, so I don’t care. The arrow and shift keys on the Brydge+ bug me, but I think I can get used to it. What I like most about the Brydge+ keyboard is its robustness and the way it so effectively lets me use my iPad as a mini laptop. And it doesn’t hurt that the double-key issue is so minimal. 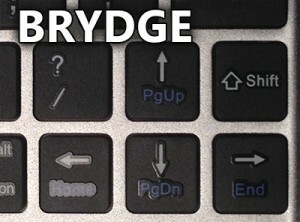 The perfect keyboard is still out there to be discovered, but for now, I choose the Brydge. Especially if you are a Windows user tired of struggling with the Delete vs. Backspace thing, or if you are looking for a way to use your iPad as a mini laptop: this is the keyboard for you.